Hazardous waste in the environment is one of the most difficult challenges facing our society. The purpose of this book is to provide a background of the many aspects of hazardous waste, from its sources to its consequences, focusing on the risks posed to human health and the environment. 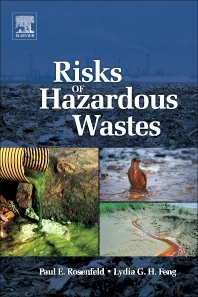 It explains the legislation and regulations surrounding hazardous waste; however, the scope of the book is much broader, discussing agents that are released into the environment that might not be classified as hazardous waste under the regulatory system, but nonetheless pose substantial hazards to human health and the environment. It provides a background of some of the major generators of hazardous wastes, explains the pathways by which humans and wildlife are exposed, and includes discussion of the adverse health effects linked to these pollutants. It provides numerous case studies of hazardous waste mismanagement that have led to disastrous consequences, and highlights the deficiencies in science and regulation that have allowed the public to be subjected to myriad potentially hazardous agents. Finally, it provides a discussion of measures that will need to be taken to control society’s hazardous waste problem. This book was designed to appeal to a wide range of audiences, including students, professionals, and general readers interested in the topic.